Born in Rome of a noble family, Paula married Toxotius, and the couple had five children. They were regarded as an ideal married couple, and on his death in 379, she renounced the world, lived in the greatest austerity, and devoted herself to helping the poor. She met St. Jerome in 382 and was closely associated with Jerome in his work while he was in Rome. 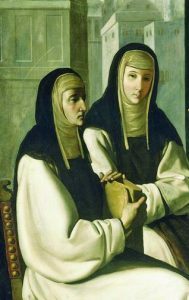 The death of her daughter Blesilla in 384 left her heartbroken, and in 385 she left Rome, travelled to the Holy Land with Jerome, and a year later settled in Bethlehem under his spiritual direction. She and her son Eustochium built a hospice, a monastery and a convent, which Paula governed. She became Jerome's closest confidante and assistant, taking care of him and helping him in his biblical work, and built numerous churches, which were to cause her financial difficulties in her old age, and died at Bethlehem in 404. She is the patron of widows. Saint Paula, obtain for us a great love of the Scriptures. Canute was the son of King Eric the Good of Denmark and was brought up in part at the Saxon court of Lothar, who later became emperor. As a second son, Canute was a duke whose territory served as a bulwark against the Slavic Wends, whom he also encouraged Bishop Vicelin of Oldenburg to convert. His power in the Wendish march grew, to the anxiety of his uncle King Niels, especially as Niels was recognised by Lothar as the king of the Wends. Canute was hailed as a just and peaceful man, and his name suggests he was viewed, either by contemporaries or posthumously, as a lord. King Niels was worried about his nephew's political aspirations. He feared Canute sufficiently to have two of his sons murder their cousin near Ringsted in 1131. Saint Canute, teach us to be just in all our dealings with others. Iwene Tansi was born in Aguleri, Nigeria. His parents were Igbo farmers who practised the traditional religion. At birth, like other boys, he was given his own personal idol. At the age of six, he was sent to the Christian village of Nduka, where he met the Irish missionaries. Three years later, he destroyed his idol and was baptised, receiving the name Michael. A studious and pious boy, he qualified as a teacher and worked as a catechist. In 1925, against the wishes of his family, he entered the seminary and was ordained 12 years later. Subsequent years saw him parish priest of several parishes, courageously tackling immoral customs. He travelled on foot to visit his widely-scattered parishes, would spend whole days hearing confessions and was always available to the people. 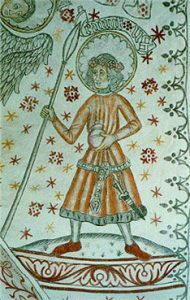 He worked particularly to give young people a good preparation for marriage and to counteract the tradition of trial marriages which prevailed among the pagans. His zeal, shining example and life of prayer and penance transformed the people into a true Christian community, resulting in many vocations to the priesthood and religious life. In 1949 or 1950, his Bishop expressed the desire that one of his priests become a monk so that a monastery could later be established in his diocese. Father Tansi immediately said he was willing and was sent to Mount Saint Bernard Abbey, near Nottingham, England, where he became Father Cyprian. The complete change of lifestyle, particularly living under obedience when he had been a leader of people, the change of climate, food and most of all the culture shock were severe tests, but he was convinced that was where God wanted him to be. For 13 years, he lived a hidden life of prayer and work, humility and obedience, in faithful and generous observance of the Cistercian rule. In 1962, the Abbey decided to make a foundation in Africa. Political tensions led the superiors to choose Cameroon rather than Nigeria. 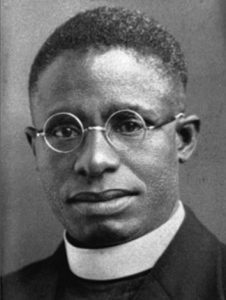 Although appointed novice master of the new foundation, Cyprian was too sick to go, and died of an aortic aneurysm on 20 January 1964, as he had lived, a man of God. Blessed Cyprian, show us the way to obedience to God’s will.